Nivea Skin Firming & Smoothing Concentrated Serum is a surprisingly good product. I wasn’t expecting to really enjoy such an inexpensive cellulite serum. It smells wonderful, dries incredible fast, and provides some results. Right away, I noticed my skin feeling and looking hydrated, soft, and smooth. After a couple weeks, I noticed my skin looking more even, soft, smooth, and hydrated. I can’t say my skin was much firmer, but the healthier my skin looks the less noticeable my cellulite appears. Overall I did notice improvement in the appearance of the skin on my thighs and stomach. The only major downside to this product is that it doesn’t have a money back guarantee. 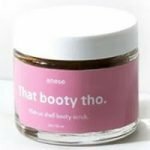 However, this is the perfect cellulite product to try if you are on a budget. 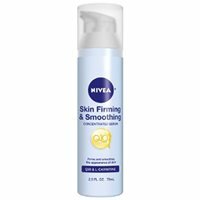 Nivea Skin Firming & Smoothing Serum is a yellow/tan serum. It looks like a gel, but feels dry almost immediately. That was weird at first because I wasn’t expecting it to feel soft and dry when it looks like a sticky wet gel. I really love how it feels and glides on the skin. The lotion should be applied morning and evening each day. It’s so easy to apply because it comes out of a pump, which is my favorite because its clean, conserves the product, and is super convenient to use in a hurry. I also love that it dries immediately making the application process so quick and simple. Nivea Skin Firming & Smoothing Serum dried almost immediately as I applied it, which I LOVED. It felt kind of weird, because the lotion itself almost feels dry and soft. This serum smells AWESOME. It has a very clean, fresh and citrus scent. I love how great this product smells! Like I said, the smell is really great. As the serum sits on the skin, the smell gets even better. It almost smells like fresh clean powder or soap. It isn’t a super strong potent scent; it’s the perfect strength. It is just strong enough to smell it during application, but subtle enough it doesn’t overpower you, the room, or your clothes. The scent obviously lessens over time, but always remains a great smell. Directly after applying Nivea Skin Firming & Smoothing Serum, my skin felt very soft and moisturized. Although it felt dry right away, my skin did feel a little sticky which I didn’t like. The immediate results consisted of moisturized, smooth, and soft skin. Overall, it didn’t take long for my skin to look more even and healthy. After a couple weeks, I noticed my skin feeling soft, smooth, and hydrated. I didn’t notice any major changes in the firmness of my skin. However, the healthier and softer my skin looked, the less noticeable my cellulite became. At most, I did notice my skin being hydrated, soft, smooth, even, and more appealing. My cellulite was slightly less noticeable, but not drastically. In my opinion, the actual results were slightly above average. Nivea Skin Firming & Smoothing Serum contains 18 ingredients, which is much less than many other products I have tried. One of the effective ingredients in this serum is Coenzyme Q10 (Ubiquinone) which is believed to have anti-aging benefits. It’s believed to protect the skin from sun-damage and prevent collagen breakdown. Another important ingredient is L-Carnitine. Supposedly, it is a fat burner that simulates fat oxidation. Using it as a topical ingredient may have varying results. L-Carnitine is believed to help with the metabolism of fat and skin health making it a common ingredient in contouring creams. One bottle of Nivea Skin Firming & Smoothing Concentrated Serum, costs $13.99. At a bottle size of 2.5oz, that works out to about $5.60 per ounce. Surprisingly, this is the least expensive product I have tried and I really enjoyed using it! This is definitely a great product to explore if you are on a budget. Unfortunately, I couldn’t find a 30-day money back guarantee for this product. I always prefer to try products that have a money back guarantee, but luckily this one is extremely inexpensive. To buy Nivea Skin Firming & Smoothing Concentrated Serum, click here.